Home » URGENT: Call Marty Meehan today to get your raise. The Governor says we have the money; UMass says we don’t. We fear that UMass is trying to use us again as a pawn to lobby for more money from the legislature by holding our raises hostage. Everyone is pointing the finger at someone else and refusing to pay us. Our sister organization, the Massachusetts Society of Professors at UMass Amherst has asked us to call Marty Meehan at 2:00 p.m. TODAY. CALL (617) 287-7050. Can’t call at 2:00 p.m.? Call anytime. Call tomorrow, call Monday, but make sure you call. Our parking fees are increasing 150%, and you are not paying us our raises of a mere 2%. Pay us our raises. The money is there. Campus unions bargained in good faith, in collaboration with your office, for almost two years. A deal is a deal! The contracts were approved by the Governor and funded by the legislature. The money is there. Faculty and staff have not had a raise since 2016. Yet our parking fees are going up. We want to work with you to advocate for more funding for UMass, but first you have to uphold our deal and pay our raises. contains the first year of funding. (The legislature can't cover more than one year because they don't have the right to direct future legislatures to allocate funds. Instead, they fund the first year and then that increase is rolled into the UMass budget going forward so the money is there.) In addition, the Governor's original budget last spring included a collective bargaining reserve that covered one year of the raises. So UMass has the money. It is clear that the administration is trying to use the unions' collective power to get the Baker administration to provide additional funds for UMass. While we always support the effort to increase state funding, this is NOT the way to do it. Our contracts were ratified in July and funded in October and signed by the Governor. Everyone has done their part and the money has been allocated by the state. UMass cannot refuse to pay us. 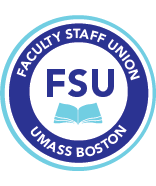 The FSU will be working closely with the other UMass unions, and together we will be taking certain actions to fix this in addition to the call-in today. We will update you on these but our sister chapter at Amherst will plan a public action to disrupt the Board of Trustees meeting at their campus on Thursday, December 13 at 9:00 a.m. if there is no resolution by then. They are calling for us to join in and protest! We will send you details.